8600 LaSalle Rd. Suite 406 Severn Bldg. It’s important for your child’s current and future health that we watch out for tooth decay. Taking x-rays is a critical part of staying one step ahead of this common disease. But while x-ray imaging is commonplace, we can’t forget it’s still a form of radiation that could be potentially harmful, especially for a child whose tissues are rapidly developing. We must, therefore, carefully weigh the potential benefits against risk. This concern has given birth to an important principle in the use of x-rays known as ALARA, an acronym for “As Low As Reasonably Achievable.” In basic terms, we want to use the lowest amount of x-ray energy for the shortest period of time to gain the most effectiveness in diagnosing tooth decay and other conditions. A good example of this principle is a common type of radiograph known as a bitewing. The exposable x-ray film is attached to a plastic devise that looks like a wing; the patient bites down on it to hold it in place while the x-ray exposure takes place. Depending on the number of teeth in a child’s mouth, an appointment usually involves 2 to 4 films, and children are typically spaced at six months apart. Frequency of x-rays depends on your child’s tooth decay risk: lower risk, less need for frequent intervals. Each bitewing exposes the child to 2 microsieverts, the standard unit for radiation measurement. This amount of radiation is relatively low: by contrast, we’re all exposed to 10 microsieverts of background radiation (natural radiation occurring in the environment) every day or 3,600 microsieverts annually. Even two appointments of four bitewings each year is a fraction of a percent of the background radiation we’re exposed to in the same year. This conservative use of x-rays is well within safe parameters for children. As x-ray technology continues to advance (as with the development of digital imaging) we anticipate the exposure rate to diminish even more. 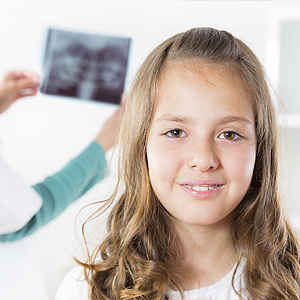 Prudently used, x-rays remain one of our best tools for ensuring your child’s teeth are healthy and developing normally. Seven out of ten Americans are missing at least one tooth due to decay, periodontal (gum) disease or injury. Unfortunately, the consequences go far beyond a missing tooth — the loss of even one could set in motion a cascade of problems. Perhaps the most damaging of these problems is bone loss. Like other living tissue, bone has a life cycle — older cells dissolve (resorb) into the body and are replaced by fresher cells. This growth cycle in the jawbone receives stimulation from forces generated by teeth when we chew or bite. If a tooth is no longer present to provide this stimulation, the affected bone cells won’t regenerate at a healthy rate. Over time this causes the volume of bone to diminish, as much as 25% the first year after tooth loss. The void left by a missing tooth can also adversely affect remaining teeth. Teeth are held in place by a tough but elastic tissue known as the periodontal ligament that lies between the tooth and the bone. The ligament enables teeth to move gradually in response to mouth changes so that the teeth remain tightly aligned with each other. When there’s a gap from a missing tooth, this tendency will cause the teeth on either side to move (or “drift”) toward the open space. 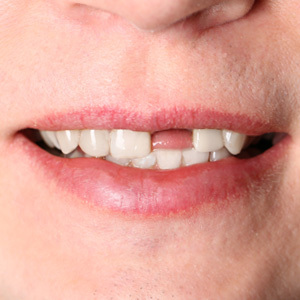 Although a natural phenomena, it can result in a malocclusion (poor bite). That’s why it’s important to replace a missing tooth with a life-like replica — not just for appearance’s sake, but also to improve function and prevent the rise of these other problems. While many options exist (from removable dentures to fixed bridges) the choice most preferred by dentists and patients is the dental implant. An implant replaces the tooth root as well as the crown, because it’s imbedded securely into the jawbone. Because of a natural affinity with titanium, the principal metal used in implants, bone cells will grow to its surface. Not only will this anchor the implant more securely, it will slow or even stop bone loss. If you have a missing tooth, you should visit us as soon as possible to consider your options for a replacement. 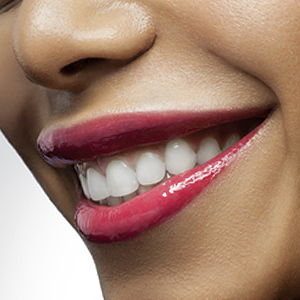 A new tooth will help stop even greater problems from occurring. We’ve all had physical ailments that were more irritating than serious. The problem of skin cracking at the corners of the mouth fits into that category. Both dentists and dermatologists encounter this condition often and have a name for it: perleche, derived from the French word lecher, meaning “to lick.” The term arises from patients’ tendency to excessively lick the broken skin to soothe the itching or burning. Perleche most often arises from certain mouth conditions, although systemic problems like anemia or diabetes may also cause it. Children or younger adults, especially those with orthodontic braces or a tendency to drool as they sleep, often develop perleche; older adults with wrinkling around the mouth are also susceptible. 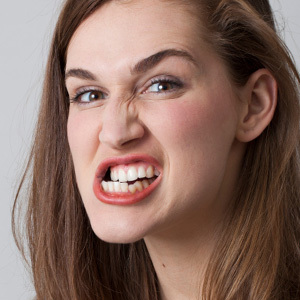 Mouth dryness caused by reduced saliva flow may also irritate the skin and cause discomfort. As the skin becomes irritated, the person may begin to lick the corners of the mouth to soothe them. This sets up conditions for an infection, most often caused by yeast known as candida albicans. The infection may become more acute and begin to affect the entire inside of the mouth or throat. If you’ve developed perleche, our primary treatment goal is to reduce any infection with the aid of oral or topical antifungal drugs. One drug, Nystatin, is often taken as a lozenge that dissolves in the mouth and works its way from there through the rest of the body. You can also apply antifungal ointments several times a day to the corners of the mouth, often in combination with steroid ointments that reduce redness and swelling. You can also apply antifungal zinc oxide paste to the cracked skin, which also serves as a barrier between the skin and outer contaminants. To reduce the chance of future outbreaks, we may recommend you rinse with Chlorhexidine, as well as replace missing teeth or refit loose dentures — these too are contributing factors to erupting yeast infections. You might also need to undergo dermatologic treatment for wrinkles if they’ve proven to be a factor in developing perleche. Although not a major problem, perleche can be exceedingly uncomfortable and embarrassing. Thanks to a number of treatment options, you don’t have to put up with that discomfort for long.